On Thursday 9 March 2017, Gordon Bull, Senior Lecturer at the ANU School of Art, introduced us to the life and works of the great Florentine artist of the early Renaissance, Giotto di Bondone, focusing particularly on Giotto’s masterwork, the Scrovegni Chapel. Giotto’s date of birth is unknown – it was some time between 1267 and 1275. He died on 8 January 1337. An innovator just before the flowering of the Renaissance in the quattrocento, he is one of the most significant figures in western art. His work moved away from the stylised, codified Byzantine style to a more naturalistic approach. It marked the beginning of direct observation as the basis of art; he painted according to what he saw. To illustrate this, Gordon showed us images of three large altarpieces that are displayed in the same room in the Uffizi gallery in Florence. All three depict the Madonna and child surrounded by angels. They are by Cimabue (1240-1302), Duccio di Buoninsegna (died 1319) and Giotto. Cimabue’s Maestà of Santa Trinita, painted between 1280 and 1290, is static and ‘codified’, with no use of perspective. The figures seem to float in a field of gold; they are not of this world. Duccio di Buoninsegna was a contemporary of Giotto, but belonged to the Sienese school of painting, which was much less innovative than the Florentine school. His Madonna Rucellai, painted in 1285, still belongs to the stylised, two-dimensional world of Byzantine art. 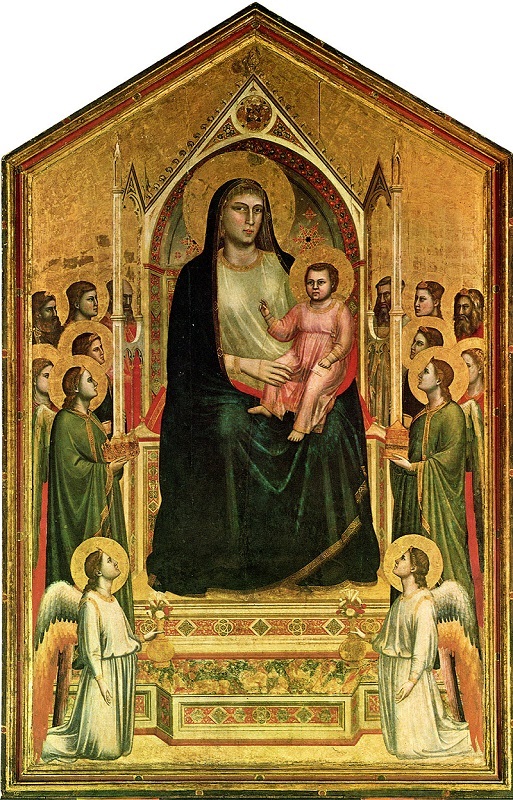 Giotto’s Madonna di Ognissanti, painted around 1310, is dramatically different from both of these works. It has a sense of real-world volume and space, and his Madonna is recognisably human. Considering that he lived seven centuries ago, we know quite a lot about Giotto’s life. Partly, this is because he was very successful and became rich, and records of his property transactions have survived. Moreover, he knew two of the most important Italian writers of his time, and they referred to him in their works. In the Divine Comedy, Dante Alighieri described how, as an artist, Giotto eclipsed Cimabue (Purgatorio, Canto XI). Giotto also appears as a character in Book 6 of the Decameron, by his friend of Boccaccio. There is a story that Dante visited the Scrovegni chapel while Giotto, surrounded by his family, was working there. Dante wondered aloud how someone who created such beautiful images could have produced such plain children. Giotto’s reply was that he created his pictures in the day, but his children in the dark. According to Boccaccio, Giotto was the ugliest man in Florence. Writing much later, in the sixteenth century, Giorgio Vasari recounted some of the legends about Giotto. One was that Giotto, as a child, was a shepherd boy and used to draw his flock on rocks in the field. When Cimabue saw these drawings, he recognised Giotto’s talent and insisted that the boy become his pupil. (Actually, Gordon told us, Giotto’s father was a blacksmith.) Another story is that the Pope sent a messenger to Giotto asking for a sample of Giotto’s work. Giotto took a piece of paper and, in front of the messenger, drew a perfect circle freehand and told him to take that to the Pope. The messenger was dismayed, but the Pope recognised how remarkable a feat this was. This story is historically unreliable, but it illustrates Giotto’s reputation for supreme skill. As the rising star of his time, he was commissioned by the wealthy banker Enrico degli Scrovegni to decorate a chapel that Scrovegni was having built in Padua. The chapel may have been intended as atonement for Scrovegni’s sins. Banking was considered morally doubtful at the time, because the Catholic Church prohibited usury, ie lending money at interest. 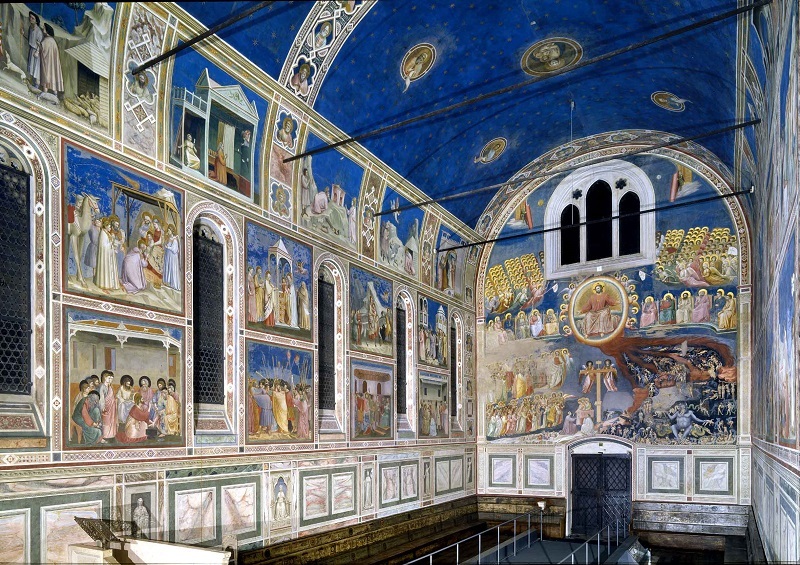 Giotto spent two years (1304-1306) painting the Scrovegni Chapel. The walls and ceilings are all in fresco, ie the pigment was applied to wet plaster. Giotto used a technique that was new at the time, putting on the wall only a small patch of wet plaster that could be painted in a single day. The result was very durable. Unfortunately, because blue pigment was very expensive, Scrovegni insisted that it be painted ‘secco’ (‘dry’), ie on top of the already dry fresco. So the blue is much more worn than the rest. The paintings are in three rows: the top row depicting the life of the Virgin and the lower two rows the miracles and life of Christ, together with panels depicting vices and virtues. The west wall contains a depiction of the last judgement, which Michelangelo went to see before painting his own last judgement in the Sistine Chapel. Gordon showed us slides of some of the narrative cycle panels, and pointed out that there is a sense of people standing in space, occupying a volume, with natural postures and gestures. Architecture is drawn so as to give a sense of three dimensions, but it does not comply with the rules of perspective, which were yet to be developed. The surrounding landscape, however, is not depicted in a naturalistic way. Nonetheless, Giotto creates an observed, not idealised, world and depicts real, observed, people. One technique that Giotto uses is the placement in the foreground of a painting of figures seen from the back, drawing the spectators into the scene. He also used shading – light and dark tones – to create volume, for example in the folds of garments. 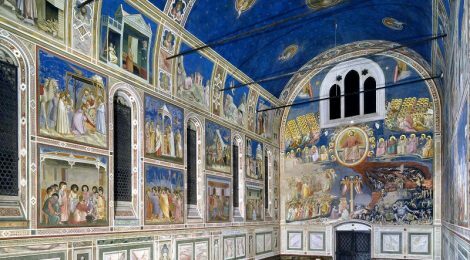 Gordon urged those of us who have not yet seen the Scrovegni Chapel to do so. You need to book at least three days in advance and are allowed only 15 minutes inside, but it is worth the effort, he assured us. Even though he had studied reproductions of the paintings for years, the first time he saw the real thing he was overwhelmed by it – it is one of the most beautiful things he has ever seen in his life.